Thanks to your fully automated Brewie system, you produced a fresh batch of wort without even breaking a sweat. But that wort's not going to do you any good just sitting there! If you don't already have your own fermentation equipment, the Brewie Starter Kit is the perfect solution. 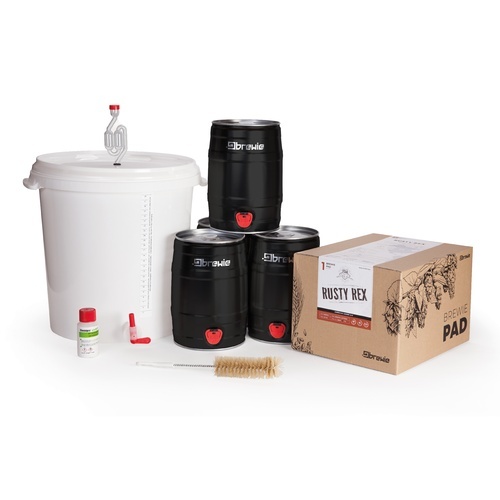 The starter kit includes everything that a new Brewie owner could wish for - bucket (with airlock) and kegs for primary/secondary fermentation and accessories for cleaning. NOTE: This product is discounted heavily because the included recipe kit is past its best before date. All of the equipment is in perfect condition. Perfect set of items to start brewing! Are the kegs reusable ? BEST ANSWER: Yes. You can remove the bung, clean out the keg and reuse. Beers last ~1 week in the mini keg. Yes I don't see a problem just rinse with PBW and flush with sanitizer. Haven't had a chance to use it yet, but 5 stars for the fast delivery! I'll update with another review once I have used it!